microRNAs (also called miRNA) are small RNA molecules that are increasingly recognized as key modulators of the body and its cells. They bind to other RNAs, and generally turn them off so that they cannot be made into protein. 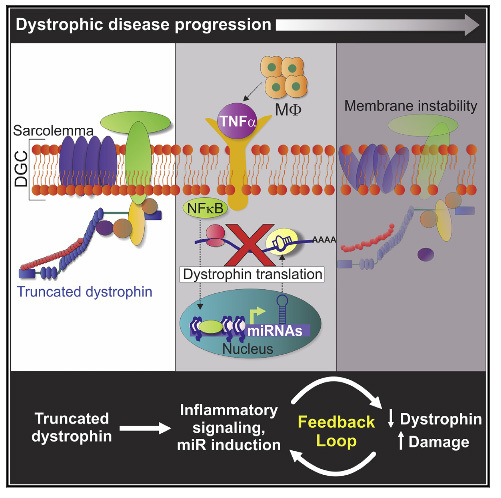 Recently, Dr. Hoffman’s laboratory showed that there are a series of miRNAs that bind to the dystrophin mRNA, and modulate dystrophin protein expression (Fiorillo et al. 2015). This research opens a new avenue to therapeutics of Becker and Duchenne muscular dystrophy via modulation of the miRNAs (see schematic). ReveraGen has an exclusive license for therapeutic applications of this research. Furthermore, a recent study has shown that vamorolone treatment reduces the levels of pro-inflammatory miRNAs in the muscle of mdx mice (a mouse model of DMD) (Fiorillo et al. 2018). Further research has shown that vamorolone treatment results in beneficial changes in the dystrophin-targeting microRNAs in mouse muscle; read it here.